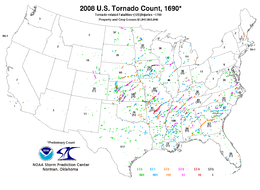 This page documents notable tornadoes and tornado outbreaks worldwide in 2008. Strong and destructive tornadoes form most frequently in the United States, Bangladesh, and Eastern India, but they can occur almost anywhere under the right conditions. Tornadoes also develop occasionally in southern Canada during the Northern Hemisphere's summer and somewhat regularly at other times of the year across Europe, Asia, and Australia. Tornadic events are often accompanied with other forms of severe weather, including strong thunderstorms, strong winds, and hail. There were 1,692 tornadoes confirmed in the United States in 2008, with 126 confirmed fatalities. This made 2008 the deadliest year in that country since 1998 with 2011 and 2004 having more tornados other fatalities have been reported elsewhere in the world: three in France, two each in Bangladesh and Poland and one each in Russia and China. With 1,692 confirmed tornadoes, 2008 ranked as the third most active US tornado season on record, only 2011 and 2004 have had more tornadoes confirmed with 1,697 and 1,817, respectively. The US state of Kansas received the most tornadoes in the United States in 2008 with 187. The winter months of January and February (usually a fairly quiet time of year for severe weather) were unusually active in 2008 in the US, with several major outbreaks taking place. The first major outbreak took place on the week of January 7, which was unusually far north for January. February saw a new record for tornadoes in that month, with one of the most prolific outbreaks in recent years (and the deadliest since 1985) taking place on February 5, and three smaller outbreaks also taking place later in the month. March was also fairly active, but not at record levels. Steady activity in the first week of the month, an outbreak on March 15 and additional activity at month's end were mostly responsible. April was also active, which was due to steady tornado activity throughout the month despite the fact there were no prolific outbreaks. From the beginning of May until mid-June, severe weather was frequent and widespread across the US. Beginning with a significant outbreak on May 2, there were many major outbreaks over that period with smaller outbreaks occurring almost daily. Over that six-week period, well over 600 tornadoes were reported in the US, with many destructive tornadoes over that time frame. The worst tornado events were on May 10, May 22–23, May 25 and June 11. After that, activity calmed down somewhat to a more normal pace in the second half of June and into July with several smaller severe weather events. The summer and early fall months from July to September ran somewhat above average in the US; tropical cyclones and their remnants were mostly responsible from mid-August through mid-September, particularly from Tropical Storm Fay, Hurricane Gustav and Hurricane Ike which each resulted in large numbers of tornadoes (mostly weak). Activity dropped significantly in October, with below normal activity and no major outbreaks. The relative inactivity continued into November, which was also below normal. Activity returned to a slightly above normal rate in December, with most of the activity in mid-month. Overseas, the months of July and August were quite active in Europe though, with several significant tornado events, including at least one major outbreak. NOAA concluded there "is no evidence for a detected change in tornado activity to date due to greenhouse gas emission increases." There were 136 tornadoes reported in the United States in January, of which 84 were confirmed. A rarity for January in the Midwest, the first significant severe weather event of the year developed in the Central U.S on January 7. Over 70 tornadoes were reported that day, including major tornadoes dominated by two supercell areas. In the late afternoon, a rare series of tornadoes took place in northern Illinois and southeastern Wisconsin. EF3 tornadoes caused major damage in and around Wheatland, Wisconsin and Lawrence, Illinois. A train carrying hazardous materials was derailed in Lawrence, prompting an evacuation of the town. The Wheatland tornado was only the second January tornado on record in Wisconsin, the other being on January 24, 1967 during the 1967 St. Louis tornado outbreak. Another round of tornadoes took place in the Springfield, Missouri area. An EF1 impacted part of downtown Springfield itself. Major damage to numerous farms, mobile homes, and frame homes Marshfield and Strafford due to a long-tracked EF3 that killed three people. On January 8, more severe weather took place, including an EF2 tornado near Appleton, Arkansas that killed one person in a mobile home. Hot on the heels of the previous outbreak, another severe weather event occurred across the Southern United States on January 10 as a new system moved across the region. The Storm Prediction Center upgraded the threat to a moderate risk late that morning as tornadoes were expected, particularly in Alabama, Mississippi and Tennessee. 20 tornadoes were reported, and four EF3 tornadoes were confirmed, including in Attala, Lowndes, and Choctaw counties in Mississippi, and Tuscaloosa County in Alabama. A tornado emergency was also issued for Lamar County, Alabama after one of these large wedge tornadoes caused extensive damage to a school and homes across the Mississippi-Alabama state line in Caledonia and in areas west of Vernon. Overall, the outbreak sequence resulted in 4 fatalities and 72 tornadoes. Also on the afternoon of January 10, a rare tornado took place in the Hazel Dell, Washington area. The initial touchdown was at 12:14 pm PST (2014 UTC), near the intersection of NW 78th St. and NW Hazel Dell Blvd. The tornado was an EF1 that touched down intermittently over a 2-mile (3.2 km) path. It knocked down about 200 trees and left minor damage to 12 houses. A high-end F1 (T3) tornado touched down in Limburg, Belgium late on January 21. The tornado was on the ground for a short time, traveling 1.4 miles (2.3 km) with an average width of 55 yards (50 m). Substantial damage was caused to roofs and barns. A very powerful cold front tracked across the central US on January 29, with extremely cold weather behind the front. A moderate risk of severe weather was issued for parts of the lower Ohio Valley. Five tornadoes were reported across the region, although most of the damage was due to straight-line winds from a serial derecho which caused significant and widespread damage across the Ohio Valley region with winds of up to 100 miles per hour (160 km/h) . It was later found that two people were killed in a mobile home in Posey County, Indiana by an isolated EF2 tornado embedded in the squall line. A third fatality took place in Clark County, Indiana due to an EF1 tornado. Other tornadoes hit Speedway, Indiana and a suburban area in Louisville, Kentucky, both were EF1. Two other deaths took place in Arkansas from straight-line wind damage. There were 230 tornadoes reported in the United States in the month of February, of which 147 were confirmed. That set a new monthly record for February. A powerful low pressure system across the central Plains started to move eastward beginning on February 4. On the morning of February 4, the Storm Prediction Center issued a slight risk of severe weather from central Texas to the lower Ohio River Valley. At the same time, a moderate risk of severe weather for February 5 was issued for parts of the lower Mississippi River Valley and the lower Ohio River Valley westward to the Ozarks, which was surrounded by a large slight risk area. However, on February 4, the thunderstorm cells remained elevated and linear, and no tornadoes were reported. On the morning of February 5, a high risk was issued for part of the region, particularly Arkansas, for the threat of strong to violent tornadoes. Later that morning, the high risk area was expanded to cover the lower Ohio Valley as well. It was the first high risk issued in February since 1998. 131 tornadoes were reported (87 confirmed). At 5:30 pm CST (2330 UTC), several tornadoes were reported in the Memphis area and a tornado emergency was issued for much of the Memphis metropolitan area after a large and dangerous tornado was reported near Horn Lake, Mississippi. Major damage was reported across Southaven and southeast Memphis, including industrial buildings destroyed and severe damage to Hickory Ridge Mall. At Memphis International Airport, an airline hangar had its roof removed, and the FedEx fire station suffered roof damage. Four fatalities were reported, three in a metropolitan Memphis office complex and one in Somerville, Tennessee. Another tornado emergency was declared around 7:00 pm CST (0100 UTC) for Jackson, Tennessee, followed by another one around 7:30 pm CST (0130 UTC) for areas to the northeast. Union University sustained heavy damage and was closed until February 18. Two fatalities were reported in Huntersville, Tennessee and two were killed near Morris Chapel in Hardin County, Tennessee as a result of the severe weather. Massive damage was reported in Sumner County, Tennessee after a tornado sparked a natural gas explosion at a gas pumping plant in Macon County, Tennessee just northeast of Nashville. Seven fatalities were confirmed in Sumner County and 13 were killed in Macon County, with reports of injuries numbering in the hundreds. Two additional deaths were reported in nearby Trousdale County. All 22 deaths were caused by one tornado, rated an EF3, making this the deadliest single tornado to hit Middle Tennessee in 75 years (deadliest in the US since Evansville Tornado of November 2005). In total, 57 people died in the outbreak. Another low pressure system tracked across the Gulf Coast and Florida on February 12. 21 tornadoes were reported across the region after a squall line broke into bow echo segments. One EF1 and five EF0 tornadoes were confirmed. A woman was killed in Independence, Louisiana when she was picked up and thrown outside a hospital. Other tornadoes took place in Cocoa Beach, Florida and Everglades City, Florida. A cold front moved across the southern United States beginning on February 16. One confirmed tornado in Louisiana's Pointe Coupee Parish left damage over an 8-mile (13 km) long track, with one home severely damaged. There were no reported deaths or injuries. Additional activity took place in Texas that afternoon, but far less than expected. This event continued into February 17 with the presence of a longwave trough and strong upper-level winds over the central Gulf Coast states, and new supercells developed later that day, producing tornadoes across the Florida Panhandle and Alabama. 24 tornadoes were confirmed out of 50 reports (however, some were later confirmed as straight-line winds). Severe damage was also reported in Prattville, Alabama, however no fatalities were reported. An EF2 tornado in Greene, North Carolina injured three people. Two mobile homes had their roofs torn off and a two-story home was leveled. In the mid-afternoon, a tornado emergency was issued for the area around Prattville, Alabama, and a long-track EF3 tornado was confirmed in the area, with 50 injuries but no fatalities. Another system tracked across the Deep South beginning late on February 25 and continuing into February 26. Several tornadoes took place embedded in a serial derecho which hit the region hard with 90 miles per hour (140 km/h) winds. The strongest tornado was an EF3 near Carrollton, Georgia in the early morning of February 26. One person was killed in Leeds, Alabama after a tree crashed into a mobile home. Initially thought to have been straight-line winds, it was later confirmed as an EF1 tornado. There were 150 tornadoes reported in the United States in the month of March, of which 129 were confirmed. On the morning of March 2, the Storm Prediction Center issued a moderate risk of severe weather across parts of the lower Mississippi River Valley for March 3, as a significant severe weather event was expected. The Day 2 Convective Outlook cited the potential for strong tornadoes in the moderate risk area, as well as the potential for large hail and damaging winds. The threat carried over to Day 1 and was extended to the central Gulf Coast. The first round of activity began on the afternoon of March 2, with supercells developing across Oklahoma with isolated severe weather reports, and a couple unconfirmed tornadoes in what was primarily a wind event. More activity took place on March 3, with a notable tornado in Amite County severely damaging two homes. However, overall activity was much lower than expected. The severe weather continued on March 4 across the Southeast and Mid-Atlantic States, where several more tornado reports and widespread wind damage was reported. One person was killed in a mobile home in Blount County, Tennessee by straight-line winds. A low pressure system tracked across the southern US on March 6 and 7. It produced several tornadoes along the immediate Gulf Coast, including an EF1 in Corpus Christi, Texas on March 6. In the overnight and early morning of March 7, a squall line tracked across the Gulf of Mexico and emerged in northern Florida, with supercells forming within it. Other tornadoes took place near Lake City, Florida where two people were killed and about 50 homes were damaged. An isolated supercell developed in west-central Georgia in the evening of March 14. An EF2 tornado was reported in downtown Atlanta, which caused damage to several buildings, including the Georgia Dome (while a SEC Tournament basketball game was underway), the World Congress Center, Philips Arena (during an Atlanta Hawks game), and CNN Center. Many windows were blown out of the Omni Hotel, which was evacuated. Nine people were injured and there was one death from the tornado. The tornado was later confirmed as an EF2 on the Enhanced Fujita Scale and had a path length of about 6 miles (9.7 km) long and 200 yards (180 m) wide. The Georgia insurance commissioner's office made a final cost tally of a half-billion dollars (100 million at the GWCC alone), making it one of the most expensive tornadoes in history. On March 15, a moderate risk of severe weather was issued for the same area, with more tornadoes possible. At midday, the risk area was extended to the Carolina Coast. Later that day, a high risk was issued for Northern Georgia and part of South Carolina. Two people were killed in Georgia by a tornado. A tornado emergency was also issued on the afternoon of March 15 for Atlanta and its immediate suburbs for a tornado that did not occur, although the extremely ominous rotating cloud was shown live on TV towercam. A low pressure system tracked across the southern Great Plains on the evening of March 30. Isolated supercells developed along the dryline in western Oklahoma in the late evening hours, continuing into the overnight hours. The storms approached the Oklahoma City metro area after dark, and produced an EF1 tornado in Edmond, Oklahoma, around 1:50 am CDT (0650 UTC) on March 31. The Storm Prediction Center issued a moderate risk for severe weather from northeastern Texas to southwestern Missouri on the morning of March 31. There were 11 tornadoes confirmed in southwest Missouri, with the strongest being an EF2 near Buffalo, Missouri. There were 189 tornadoes reported in the United States in the month of April, of which 189 were confirmed. On April 3, an EF2 tornado struck the Little Rock metropolitan area. The tornado damaged areas of the central part of Little Rock and moved past the National Weather Service office in North Little Rock, where the airport also sustained damage to hangars and aircraft. There were 10 confirmed tornadoes that struck central Arkansas on this day. More supercells developed on April 4 across the south. 21 tornadoes were reported in Alabama, Louisiana, Mississippi, South Carolina, and North Carolina. Significant damage was reported near Vicksburg and north of Jackson, where 20 people were injured by an EF2 tornado in the area. On April 8, four tornadoes were reported with an EF1 tornado confirmed in Allegan County, Michigan, where it damaged a horse barn and a trailer. Cells began to develop across parts of Texas on the afternoon of April 9. An intense supercell in the late afternoon developed near Breckenridge, Texas, where a tornado emergency was declared. The tornado hit the southern edge of the town, where 15 people were injured. Several other tornadoes were reported across both Texas and Oklahoma ahead of a powerful squall line, and significant wind damage from a serial derecho was reported in the overnight hours. Eight tornadoes were confirmed on April 9 and the early morning hours of April 10, including two EF0, four EF1 and two EF2. Also on April 10, two tornadoes were reported with both of them being confirmed as EF0 tornadoes, which touched down in southeastern Missouri with several others reported during the evening across southern Iowa where there were reports of damage. Five tornadoes were reported across the Des Moines, Iowa coverage area including two EF0 and three EF1. While no tornadoes were reported across most of the areas of Arkansas and Tennessee during the afternoon and evening hours, as a forecast major tornado outbreak did not materialize; one EF1 tornado was later confirmed in Grant and Saline Counties, but for earlier storms. One EF0 tornado in St. Joseph, Missouri left some minor damage and one person injured. Another round of severe weather began on the morning of April 11, with two main supercell areas – one stretching from central Kentucky to central Mississippi, and another in the central Great Lakes. One confirmed EF3 tornado caused extensive damage to some homes and buildings as well as one injury north of Lawrenceburg in Lawrence County, Tennessee and continued into Wayne County, Tennessee. Another tornado, rated a high-end EF1 in Warren County, Tennessee damaged 60 homes about 11 miles (18 km) west of to 5 miles (8.0 km) northeast of McMinnville. 10 tornadoes were reported from Alabama to Kentucky. Damaging wind gusts as high as 86 miles per hour (138 km/h) caused significant structural damage in downtown Gadsden, Alabama, while in Hoover, Alabama, parts of the roof of an apartment complex collapsed. 11 tornadoes, including five in Kentucky (two EF1 and three EF2), four in Alabama (all of them EF0) and two in Tennessee (an EF1 and an EF3), were later confirmed. Europe's first significant tornado event of 2008 took place early on April 9 across the Iberian Peninsula. The strongest tornado, a high-end F2 (T5), tracked through parts of Amiãis de Baixo east of Torres Novas in eastern Portugal. Six people were injured in that tornado and significant damage was reported among a 6-mile (10 km) long path. Furthermore, two other tornadoes struck areas in Portugal (near Póvoa e Meadas) and near El Batán in the western Extremadura region in western Spain. 21 tornadoes were confirmed across northern and central Texas on April 23. One tornado, rated low-end EF2, produced extensive damage to some homes in Crowley, Texas. On April 24, several severe storms spawned a few tornadoes in the Midwest, most of the activity occurring in northern Kansas. Four tornadoes were confirmed across Iowa and Wisconsin on the following day with the strongest being an EF2 in Muscatine County, Iowa. There were 15 confirmed tornadoes on April 28 as low-topped supercells developed in eastern Virginia and eastern North Carolina. The three stronger tornadoes were in Suffolk, Virginia, Colonial Heights, Virginia, and Brunswick County, Virginia near Freeman. The other three tornadoes were located in the Claremont area of Surry County, Virginia, Carrsville in Isle of Wight County, Virginia, and the border of Mathews County, and Gloucester County, Virginia. These tornadoes were less damaging than the ones mentioned above. The tornadoes are reported to have injured more than 200 people. Many houses were damaged or destroyed. Also, the Southpark Mall in Colonial Heights and one elementary school were heavily damaged. Damage was also reported to a Suffolk hospital after cars were tossed around by the wind. One fatality was reported, but was found to not be storm-related. 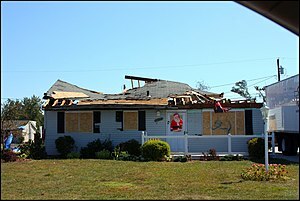 Eight tornadoes in Virginia and one in North Carolina were confirmed and rated including the EF3 storm that hit Suffolk. The Brunswick County tornado as well as the storm in Colonial Heights were both rated EF1. There were 597 tornadoes reported in the United States in the month of May, of which 461 were confirmed. The Storm Prediction Center issued a Moderate Risk of severe weather for eastern Kansas from east of Wichita to near Kansas City on May 1 and later was extended to northeastern Oklahoma. Scattered tornadoes were reported from Iowa to Oklahoma. There were reports of a wedge tornado near Ralston, Oklahoma according to KOCO-TV and KFOR-TV coverage and storm chasers. A total of 19 tornadoes were reported, although no significant damage from tornadoes were reported. In the overnight hours, a strong squall line/serial derecho formed across the central US. Widespread tree and building damage was reported across the Kansas City metropolitan area. Winds as strong as 85 mph (136 km/h) were reported, and many power outages also took place, impacting about 50,000 customers. About 200 buildings were destroyed and many others damaged. A deadly tornado took place in the Barisal and Magura districts of Bangladesh on May 5. Two people were killed and seven others were injured as a result of a tornado that hit some corrugated structures. Straight-line winds caused numerous other fatalities in the area. More tornadoes developed that evening across North Carolina with unconfirmed reports in Virginia and Maryland as well. Central North Carolina was hardest hit, with several communities sustaining severe damage. Late on the 8th or early on the 9th, one person was killed and three were injured by a confirmed tornado near Greensboro, North Carolina. It was given a preliminary rating of EF2, with windspeeds of around 130 miles per hour. Planes at the Piedmont Triad International Airport and several buildings including warehouses and businesses were damaged. A confirmed EF3 tornado was reported to have hit Forsyth County, North Carolina, with windspeeds of up to 140 miles per hour. The worst damage occurred near Frye Bridge Road and Moss Creek Lane near Clemmons, an area was also hit by an F3 almost exactly 10 years earlier causing major damage throughout the town. Two other tornadoes including an EF1 and an EF2 were confirmed in southwestern Virginia. Hot on the heels of the previous severe weather event, another severe weather event developed May 10 and 11. A moderate risk of severe weather was forecast from the Carolina Coast southward through most of Georgia. Significant tornadoes, large hail, and damaging winds have been reported, with at least 23 people killed. The activity was slow to develop with only elevated hail-producing cells, but late in the afternoon, several supercells developed across eastern Oklahoma with reports of large and dangerous tornadoes. The worst tornado caused EF4 damage in Newton County, Missouri. Significant damage has been reported in several communities, with at least 23 deaths reported (21 by tornadoes). Thirteen people were killed in Newton County, one near Purdy, Missouri, one near Carthage, Missouri, 6 deaths near Picher, Oklahoma, and one in Laurens County, Georgia. More are feared dead or trapped in the rubble. Another death was reported near Carthage, Missouri due to straight-line winds. A frontal system produced widespread severe weather, especially over Georgia and the Carolinas. While most of the reports were for wind or hail, several tornadoes touched down in the region. The most notable tornado was in the area of Holly Springs, Georgia, where about 2500 houses were damaged by a strong (high-end EF2) and very large wedge tornado. Four people were injured there. An intense bow echo produced tornadoes in Hungary. A storm system (separate from the Great Plains storm system) produced several tornadoes in Riverside County, California. The first tornado was reported from March Air Force Base in Moreno Valley, and produced generally minor damage to structures. Another touchdown was located in Corona, and more funnel clouds were reported near Hemet and Lake Elsinore. Some of the damage reported include a flipped semi-trailer truck and a train derailment. In the end, four tornadoes were confirmed, with the Moreno Valley tornado being an EF2 – the strongest in the state since 1998. The Storm Prediction Center issued a moderate risk of severe weather for May 22 in the Central Plains, including a risk of strong tornadoes and destructive hail. A slight risk of severe weather was issued from May 23–26 throughout the Memorial Day weekend for various regions across the Great Plains and Midwest, including the risk for further tornadoes. The risk area was upgraded to a high risk for parts of Kansas later in the afternoon of May 22. The Storm Prediction Center stated that "a regional tornado outbreak appears likely". At about 11:30 am MDT (1730 UTC) on May 22, a powerful tornado touched down in Weld County, Colorado moving between the towns of Gilcrest and Milliken, about 45 miles (72 km) north of Denver. A damage survey indicated that the tornado was a low-end EF3. Weld County officials closed U.S. 85 at Highway 60 after two semi-trailers were blown over at that location. The truck drivers were not believed to be injured. As many as 60,000 customers were without electrical power in Greeley, and a man was killed in a recreational vehicle outside of town. The tornado slammed into a business park in Windsor, reportedly flattening several buildings, and knocked a cut of railroad cars off their axles. The area was described as "total destruction" by an emergency responder. A 52-year-old man was killed at a campground near Greeley, while thirteen people were treated at hospitals, and more than 100 others received medical attention for minor injuries. 596 homes were damaged, with 102 deemed unsafe to occupy An EF2 struck, Laramie, where there was damage to two schools, several homes, an apartment building, a Wal-Mart, and several other businesses. The Governor of Colorado Bill Ritter declared a state of emergency and activated the Colorado National Guard in Weld County. Many more tornadoes took place in western Kansas and southwestern Nebraska later in the afternoon and evening, but most were in open country and no fatalities were reported. A few tornadoes, including an EF2, touched down as far west as southern California that evening as well. Image of the EF5 Parkersburg tornado after it struck the town. On May 23, the Storm Prediction Center issued a moderate risk of severe storms for most of the same areas affected by the previous day's tornadoes, including central Kansas, southwestern Nebraska, far northeastern Colorado and far southeastern Wyoming. Strong tornadoes and damaging hail were again expected in those and surrounding areas. Multiple significant tornadoes ripped through the Central Plains states that evening, especially western and central Kansas. Numerous tornadoes touched down in Gove, Sheridan, Ness, Rooks and Ellis counties, many of which were very large and wedge-shaped. Two people were injured in the Quinter area by a large and violent EF4 wedge that impacted multiple farmsteads. A nighttime EF3 near Cairo picked a car up off of a road and threw it hundreds of yards into a field, killing the couple inside. In Ellis, the town was struck by two consecutive EF1 tornadoes that caused heavy roof damage, broke windows, severely damaged small structures and left the town without power, but no homes were flattened and there were few injuries. One extremely large EF3 near the town of Mullinville grew up to 1.8 miles wide. On May 24, several tornadoes occurred in Oklahoma and Kansas. An EF1 tornado destroyed three barns at a hog farm near Lacey in Kingfisher County, Oklahoma, about 75 miles northwest of Oklahoma City. EF2s from the same parent supercell affected other rural areas. No injuries were reported at the farm or elsewhere in the state. In Garfield County, Oklahoma, a trailer was blown onto State Highway 74 near Covington and power lines were downed. On May 25, an EF5 wedge tornado caused extreme damage in the Iowa towns of Parkersburg and New Hartford. Residents in Parkersburg were evacuated because of a gas leak. The destruction was extensive, with damage to at least four major businesses and a high school, with more than 400 homes damaged and 222 of them destroyed. Twenty-one commercial buildings, including City Hall, were also destroyed in Parkersburg. Damage in New Hartford was limited to a cemetery and single subdivision at the north edge of town, where multiple homes were obliterated and swept away. Nine people were killed by this EF5 tornado. A major severe weather outbreak was expected over the Midwest, stretching eastward into the Great Lakes region. The Storm Prediction Center issued a high risk of severe weather for portions of eastern Nebraska, western Iowa, and extreme southeast South Dakota for May 29 with a moderate risk stretching from north central Kansas to southwestern Minnesota. Later during the day, a moderate risk was issued for May 30 from northeastern Missouri to northern Indiana. Tornadoes struck central Nebraska, causing damage to businesses and homes. Multiple tornadoes, including two EF2s, occurred in and around Kearney, where 90 rail cars were blown off the tracks outside the city limits. The tornadoes downed numerous trees and power lines in Kearney, and caused considerable damage at the University of Nebraska at Kearney campus, at the local airport, and at the county fairgrounds. A large multiple-vortex EF3 caused major damage in Jewell in north-central Kansas, but no injuries were reported. Nebraska Governor Dave Heineman declared a state of emergency, which allowed access to state and federal resources for storm cleanup. On May 30, 18 people were injured as an EF2 tornado tore through residential areas of eastern Indianapolis. A line of storms also struck Illinois, spawning one EF1 tornado that damaged four homes, several outbuildings, and a grain bin near Waverly and Auburn. On May 31, a moderate risk of severe weather was issued for parts of the Mid-Atlantic and Northeastern United States. Activity was mostly limited to hail and damaging wind events although a few tornadoes were reported. Overall, this outbreak sequence resulted in 13 fatalities. There were 394 tornadoes reported in the United States in the month of June, of which 294 were confirmed. More severe weather took place in the central US in the first week of June. A moderate risk was issued for June 3 across the Ohio Valley, with both significant tornadoes and a derecho event possible. In Indiana, an EF3 tornado ripped through Moscow at about 10:30 pm EDT (0330 UTC). 10 people were injured in Moscow, with one victim who died two months later after getting impaled in the upper chest by a 3-inch (7.6 cm) diameter tree limb. Fifty buildings were damaged, along with military and civilian vehicles in Camp Atterbury, with two soldiers suffering minor injuries. A covered bridge was also destroyed. There were 18 reported tornadoes on June 3. The threat continued on June 4 with another moderate risk in the Mid-Atlantic States, where a derecho event developed in the Baltimore-Washington metropolitan area that afternoon, knocking out power to 200,000 customers. In Annandale, Virginia, a woman was killed when a tree fell on top of her vehicle. The death was caused by straight-line winds. An EF0 tornado also struck Chesapeake Beach, Maryland, injuring five people and damaging 14 homes and one business. As that system passed, another unseasonably strong low pressure area tracked across the Great Plains. The Storm Prediction Center anticipated a tornado outbreak beginning June 4 through June 6, including possible "strong...long-tracked tornadoes". A moderate risk of severe storms was issued for both June 4 and 5. In Nebraska, farm buildings were damaged or destroyed by a tornado that hit Ulysses. Residents of Ceresco were evacuated from their homes because of downed power lines and trees caused by two EF1 tornadoes that hit the area. Tornadoes also touched down in southern Iowa, causing isolated damage in rural areas. A tornado seriously damaged one house near Emerson. On June 4, 40 tornadoes were reported (not including those related to the eastern systems). In the 1300 UTC outlook on June 5, the Storm Prediction Center issued a large high risk area for much of the Great Plains and Upper Midwest, with the potential for many strong to violent tornadoes and/or a large derecho event. Forecasters had warned of a potentially historic outbreak, as computer forecasting models for June 5 resembled those on June 8, 1974, when 39 tornadoes raked the southern Plains and killed 22 people. Wichita State University canceled evening classes because of the weather predictions. In Craig, Missouri, three semi-trailer trucks were blown over by a tornado on Interstate 29. One of the drivers needed to be extricated. 35 tornadoes were reported, but most were in sparsely populated areas. Winds as strong as 92 miles per hour (148 km/h) were also reported. While the threat was much lower on June 6, a tornado raked a half-mile (0.80 km) wide path of destruction in northwestern Minnesota, which caused widespread damage in Park Rapids. A house overlooking Pickerel Lake near Emmaville was destroyed. A turkey farm near Blueberry Lake was destroyed and a small housing development suffered minor damage. On June 7, a moderate risk was issued for parts of southern Wisconsin, northwestern Illinois and Iowa. Eight tornadoes were confirmed along the entire track from Livingston to Cook County including four EF2 tornadoes in Will County, causing significant damage to some Chicago southern suburbs near the Indiana state line, including Chicago Heights, Wilmington, University Park and Richton Park. Six injuries were reported with one person injured at Interstate 57. A tornado was also spotted in Lake County north of Chicago during the early evening hours. In Wisconsin, six people suffered minor injuries after a tornado ripped through Columbia County. On June 8, two tornadoes touched down in Millard, Nebraska at about 2:15 am CDT (0715 UTC) before merging into one. The EF1 and EF2 tornado caused damage to about one hundred homes and businesses. The Heartland Center for Reproductive Medicine had its lobby blown off, and a Carquest store also sustained major damage. In Florida, a tornado struck North Fort Myers, causing minor damage to 44 homes, moderate damage to 12 homes, and destroying one home. One person suffered a minor injury. In Michigan, three people were killed by non-tornadic winds. On June 9, a tornado swept through the southern Perth suburb of Rockingham. The tornado had reached wind speeds of 93 miles per hour (150 km/h). The State Emergency Service responded to more than 200 calls for help and the tornado damaged more than 130 homes. A severe weather event developed on June 11 across the central and northern Plains. A moderate risk of severe weather was issued for the region. Four people were killed and 48 people were injured when a tornado struck the Little Sioux Scout Ranch in Little Sioux, Iowa. In Kansas, one person was killed in Chapman when an EF3 tornado damaged 80 percent of the town, including the downtown area. The tornado destroyed 69 homes in Chapman. Another person was killed in the small town of Soldier, where a tornado damaged 32 homes. In Manhattan, an EF4 tornado caused significant damage to the southwest side. It also caused damage to Kansas State University, where Cardwell Hall, Ward Hall, Burt Hall and the engineering complex suffered damage and the Wind Erosion Laboratory was destroyed. The Sigma Alpha Epsilon fraternity house was also damaged. A tornado also destroyed nine homes and a cabinet manufacturing company in Salina. On June 12, a total of 24 tornadoes were reported, with four confirmed tornadoes (three EF0 and one EF1) hitting Wisconsin, causing tree damage in Columbia, Green, and Dane Counties. An EF0 tornado was also confirmed in Manistee, Michigan, which tracked through forested land. On June 13, 18 homes suffered damage after an EF0 tornado hit Cape Coral, Florida. In Missouri, an EF1 tornado hit Grandin. Two houses were damaged and a large barn had one wall and door blown off and large sections of roof missing. On June 19, an EF1 tornado hit eastern Springfield, Missouri at around 3:30 pm CDT (2030 UTC). The tornado uprooted trees and damaged buildings, including causing a roof to collapse at a furniture store. It was the second tornado to hit the city in 2008; the first was an EF1 that hit the downtown area on January 8. An EF1 tornado also hit Chatham County, Georgia, damaging a fire station and knocking a steeple off a church. A tornado in the China province of Anhui caused one fatality and destroyed 650 homes in just five minutes. 45 people were injured by the tornado, which caused $2.8 million (18.5 million yuan) in losses. More than 20,000 people were affected by the tornado and 950 were relocated. On June 28, an EF1 tornado moved through rural areas of McDonald County, Missouri. The tornado uprooted trees with one tree falling on a home near Plainview, injuring two people. On June 29, an EF0 tornado hit Johns Island, South Carolina at around 3:35 pm EDT (1935 UTC). The tornado damaged trees as well as some small structures in the area. Portions of a fence surrounding the St. John's High School stadium were also destroyed. There were 120 tornadoes reported in the United States in the month of July, of which 94 were confirmed. The largest severe weather outbreak in Europe in 2008 took place. At least 20 tornadoes were reported across a large section of the continent. At least one person was killed and one other was injured in northwestern Russia, with the fatality taking place in Udmurtiya where a house was destroyed. The strongest tornado was at least an F2. Other tornadoes were reported in Germany, Italy, Poland, Croatia, Latvia, the Netherlands and Denmark. After a lull in activity, several small tornado events took place in the second week of July, mostly in the northern Plains region. On July 7, several tornadoes were reported near the Manitoba/North Dakota border causing damage to trees, roofs, and boats. Among the areas hit were Bottineau, Rolette and Towner Counties in North Dakota as well as Lake Metigoshe and Turtle Mountain Provincial Park in Manitoba. An EF3 tornado destroyed 12 homes and damaged 18 homes in Rolla and destroyed eight homes and damaged 47 homes in Belcourt. An EF1 tornado also touched down in Green Lake County, Wisconsin. On July 8, a barn roof was removed by an EF0 tornado that hit Whitley County, Indiana. An EF1 tornado ripped off part of a warehouse roof in Petersburg, Virginia on July 9. On July 10, two EF0 tornadoes accompanied by strong downburst winds caused damage to homes, farms and crops in Southeast Minnesota. An EF3 tornado hit Willmar, Minnesota on July 11, injuring two people, while destroying three homes and damaging eight other homes, three turkey barns, and two businesses. The event on both July 10 and July 11 occurred as two powerful lines of storms including a bow echo crossed the I-94 corridor from the North Dakota/Minnesota border to the Chicago area producing widespread damaging winds. A strong tornado ripped through the community of Medvode in Slovenia, which was rated a T6 (F3). No injuries were reported but damage was extensive including several houses destroyed and numerous others damaged. An EF0 tornado tracked for 4 miles (6.4 km) through Sherburne County, Minnesota on July 19, destroying a few sheds and causing minor damage to homes. In Wisconsin, an EF1 tornado hit the town of Menasha, causing damage to an apartment complex and three other buildings. An intense line of storms moved through much of New England during the day on July 24. The area hardest hit was in central New Hampshire, particularly around the Epsom–Deerfield area, where a confirmed EF2 tornado touched down. The tornado killed one person, destroyed six homes, and damaged 200 other homes. Nine towns suffered heavy damage and six towns suffered minor damage in New Hampshire. A dozen people were injured according to New Hampshire Governor John Lynch. It was the first killer tornado in New England since 1995 and the first killer tornado in New Hampshire since 1946. The outer bands of Hurricane Dolly moved ashore in extreme South Texas beginning on July 22 well ahead of landfall. Several tornadoes were reported across the region as a result. The strongest of the tornadoes toppled over a roof and uprooted trees in Bayview, well to the north of the landfall location. On July 24, an EF0 tornado ripped off roofs from commercial buildings and damaged numerous homes just south of downtown San Antonio. An EF2 tornado moved through New Hampshire on July 24, 2008, and caused significant damage, killed one person, injured at least two, and prompted the issuance of a tornado watch for Maine. A tornado narrowly misses some lakefront properties just north of Balsam Lake near Coboconk, Ontario destroying a tall stand of forest. There were 145 tornadoes reported in the United States in the month of August, of which 101 were confirmed. A tornado hit the Northern-French towns of Hautmont and Boussieres-sur-Sambre in the late hours of the day, killing three people and injuring 13 others. Many homes were severely damaged, tearing the roof off some and collapsing or even blowing down others. Cars were reportedly flung through the air, and the tornado was rated T8 (F4) according to the European Severe Storms Laboratory. A major progressive derecho tracked across northern Illinois and northwest Indiana, particularly the Chicago metropolitan area, late on August 4 into the early hours of August 5. Three tornadoes were confirmed in the region, with the strongest tornado hitting Griffith, Indiana, which was an EF2. Tornado sirens went off in downtown Chicago and fans attending a Major League Baseball game between the Chicago Cubs and Houston Astros were evacuated from the stands to the stadium's concourse. Structural damage was reported, both from the tornadoes and from straight-line winds. Winds as high as 97 miles per hour (156 km/h) were also reported. As the storms moved east onto the eastern shore of Lake Michigan, widespread damage was reported in Lake, Porter, and LaPorte Counties in Indiana. A man driving his car was killed in Michigan City when high winds knocked a tree onto his car. Later on, people in Chicago said that the "August 4, 2008 Derecho" was the worst derecho in history to hit the city of Chicago. Severe thunderstorms struck Miami–Dade and Broward Counties in Florida on August 14, where an EF1 tornado caused damage to five apartment complexes in Hialeah. Police in Hialeah also reported that two cars were flipped over by high winds. An F4 tornado hit near Balcarzowice in Poland. More than 100 homes were damaged or destroyed. Many cars and trucks were flipped over on A4 highway by strong winds. At least two people were killed and 25 others were injured. Another six tornadoes, which have damaged at least 800 homes, were reported so far. A bus carrying a Polish folk group was directly hit by a tornado and flipped over on national road number 1. A small tornado was reported in Osipy Kolonia in Poland. The largest tropical-related tornado outbreak since 2005 began with at least eight tornadoes being reported across Florida as a result of Tropical Storm Fay making landfall. The most significant damage was reported in Wellington, Florida where minor structural damage was reported and many doors and windows were blown out by an EF2 tornado. Damage was also reported near Barefoot Bay from a possible tornado that resulted in three structures being uninhabitable. Tree damage was also reported in several communities. Another round of tornadoes related to Fay took place on August 22 and 23. 11 more tornadoes were reported across Florida into southern Georgia. A tornado also set ground on August 25, near the Florida city of Crestview. More tornadoes took place on August 25 through 27 across Alabama, Georgia and the Carolinas, although most were weak and short lived. There were 133 tornadoes reported in the United States in the month of September, of which 111 were confirmed. A tornado outbreak occurred as a result of Hurricane Gustav, which made landfall early on September 1 in southern Louisiana. Most of the tornadoes were weak, although a few were damaging. The most severe damage in the first wave of tornadoes was in Jefferson Parish, Louisiana (which had already been hit by Gustav's winds and rain), where a tornado late on the afternoon of September 2 destroyed numerous houses, an apartment complex and a restaurant, and damaged many other buildings. More tornadoes were reported on September 2 and the early morning hours of September 3. In Evangeline Parish, Louisiana near Mamou, a tornado during the early hours of September 3 damaged several houses and killed two people as well as injuring several others. In total, over the four days, 68 tornadoes were reported and 50 were confirmed. An EF1 tornado was confirmed by the National Weather Service to have touched down in Allentown, PA before 3 pm as a result of Tropical Storm Hanna. Some houses, many trees, and a portion of Louis E. Dieruff High School were damaged due to the very brief tornado. No injuries were reported. As Hurricane Ike approached the upper Texas coast, the outer bands spawned several tornadoes in Louisiana. The most notable tornado damaged at least 15 houses in the community of Mamou, not far from where a tornado killed 2 during Gustav. At the same time, a cold front tracked across parts of the Midwest. Several tornadoes were reported in the Kansas City metropolitan area eastward into central Missouri with structural damage reported. At least 3 tornadoes have been confirmed in: Sedalia, Missouri, DeSoto, Kansas and the strongest storm being rated EF1 in Douglas County, Kansas. On September 13, the same two systems as they began to combine into one produced two separate tornado areas – one to the east of Ike's track from Louisiana to Missouri, and another focused in southern Michigan. An EF2 tornado struck Plymouth Township, Michigan; damaging an apartment complex, flipping over cars, and knocking out power to several hundred residents. A tornado touched down in the village of Paw Paw. Another tornado briefly touched down in Calhoun County by Battle Creek, and headed southeast toward the Homer area before dissipating. dissipating. In Arkansas, six tornadoes – all rated EF1 – were confirmed. There were 28 tornadoes reported in the United States in the month of October, of which 21 were confirmed. Four tornadoes were reported across northern Germany and the Netherlands, one of which may have been a gustnado. The worst tornado, an F2 (T4 on the TORRO scale), snapped or uprooted hundreds of trees near Marienthal, Brandenburg, Germany. Several tornadoes were reported across the Deep South as a small system moved through. The most significant damage was in Enterprise, Alabama, which was previously devastated on March 1, 2007 by a violent tornado. The civic centre was heavily damaged and several houses and businesses were also damaged by an EF1 tornado there. Other tornadoes were reported in several other communities in the Florida Panhandle and southern Alabama, although no injuries were reported. Altogether, 12 tornadoes were confirmed. There were 20 tornadoes reported in the United States in the month of November, of which 15 were confirmed. During the early morning hours of November 15, a supercell thunderstorm tracked across central North Carolina, where a total of eight tornadoes were confirmed. One death was reported in Wilson County after a house was destroyed in Elm City. Another death was reported in Kenly. Damage to homes and barns were reported in Sampson, Johnston and Wilson counties. At least one EF2 and one EF3 tornado were confirmed in Johnston and Wilson Counties. There were 50 tornadoes reported in the United States in the month of December, of which 46 were confirmed. In the morning hours of December 9, tornado watches were issued for much of the south-central United States. The Storm Prediction Center issued a moderate risk of severe thunderstorms for parts of Louisiana and Mississippi, including a risk of strong tornadoes. That morning, two tornadoes touched down near Alexandria, Louisiana causing some damage. Late that afternoon, a strong cell moved into the Yazoo City, Mississippi area, where a tornado emergency was declared. A storm chaser reported that homes, outbuildings, and businesses were damaged in Yazoo City, and the tornado was confirmed as an EF2. The tornado risk continued into the Southeastern United States in the early morning of December 10. A few isolated tornadoes were also reported along the Southeast coast on December 11. There were a total of 33 tornadoes confirmed and seven people were injured by the tornadoes. The final severe weather event of 2008 developed early on December 27 across parts of the Midwest. That morning, a moderate risk of severe weather was issued for parts of the region, and tornadoes and wind damage developed. At least three tornadoes have been reported, with the most serious damage taking place near Liberty, Illinois where roofs were thrown off houses. The strongest tornadoes were rated as a high-end EF1, and eight tornadoes were confirmed. ^ "U.S. 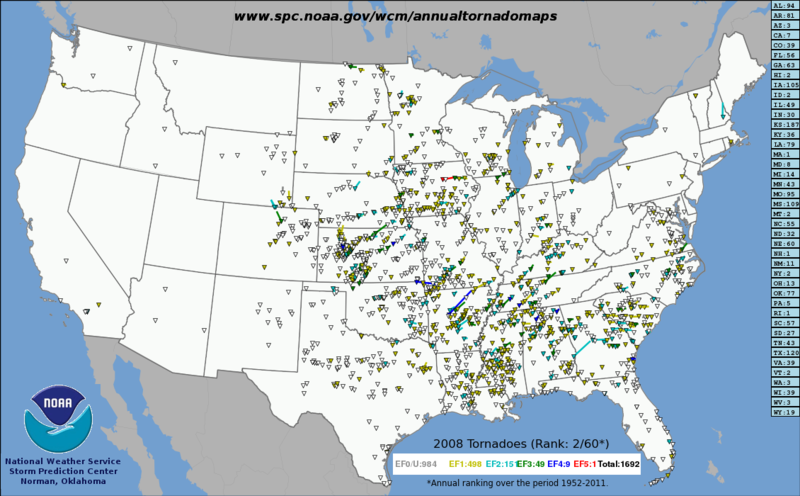 Annual Tornado Maps (1952–2011): 2008 Tornadoes". Storm Prediction Center. National Oceanic and Atmospheric Administration. Retrieved May 10, 2015. ^ Kansas again is tops in the U.S. for tornadoes. Retrieved on February 9, 2009. ^ Murry, Don R. "2008 Winter Tornadoes" (PDF). NOAA. Retrieved October 18, 2010. ^ a b c d e f g h i j k l "Monthly Tornado Statistics". National Weather Service. ^ "Probability (%) of Tornado in January (1980–1994)". National Weather Service. ^ "Storm Events". National Climate Data Center. Archived from the original on August 13, 2008. ^ Antlfinger, Carrie (January 7, 2008). "Rare January tornadoes hit southeastern Wisconsin, cause damage, injuries". thenorthwestern.com. Archived from the original on February 12, 2008. ^ "2008 Preliminary Killer Tornadoes". National Weather Service. ^ Bell, Robert (January 8, 2008). "One Person Dead In Pope County Tornado". KTHV. ^ Public Information Statement National Weather Service. ^ "Windhoos te Grote Brogel" (in Dutch). KMI. January 22, 2008. ^ "January 29th Storms – Damage Surveys Completed". National Weather Service. ^ "SPC Storm Reports for 01/29/08". National Weather Service. February 8, 2008. ^ Lenz, Ryan (January 30, 2008). "Severe storms race across Indiana; reports say 4 dead". USA Today. ^ "Strong Winds on January 29, 2008". National Weather Service. ^ "February Total Number of Tornadoes". National Weather Service. ^ "Feb 5, 2008 0600 UTC Day 1 Convective Outlook". National Weather Service. February 5, 2008. ^ "Mesoscale Discussion 155". National Weather Service. February 5, 2008. ^ Callahan, Jody (February 5, 2008). "Storms slice through Mid-South". commercialappeal.com. ^ "Reported damage map". commercialappeal.com. ^ Thomas, Dave (February 6, 2008). "Huntersville hammered; two dead". Jackson Sun. ^ "Emergency officials say 24 killed by storms in Tennessee". WMC-TV. February 6, 2008. Archived from the original on April 11, 2008. ^ "SPC Storm Reports for 02/12/08". National Weather Service. February 22, 2008. ^ Shaban, Bigad (February 12, 2008). "Tornado kills woman in Independence". WWL-TV. Archived from the original on February 13, 2008. ^ "SPC Storm Reports for 02/16/08". National Weather Service. February 26, 2008. ^ "SPC Storm Reports for 02/17/08". National Weather Service. February 27, 2008. ^ "Prattville Storm Now Identified as Category EF 3 Tornado". WSFA. February 19, 2008. ^ "Surveillance Cameras Capture Prattville Tornado on Tape". WSFA. February 19, 2008. ^ Rucker, Jeff (February 26, 2008). "Survey Indicates EF-3 Tornado Hit West Georgia". WAGT. ^ "SPC Storm Reports for 02/25/08". National Weather Service. March 6, 2008. ^ "Damaging Winds & Tornadoes – February 26th, 2008". National Weather Service. ^ "Mar 2, 2008 1730 UTC Day 2 Convective Outlook". National Weather Service. March 2, 2008. ^ "Mar 2, 2008 0600 UTC Day 1 Convective Outlook". National Weather Service. March 2, 2008. ^ "SPC Storm Reports for 03/02/08". National Weather Service. March 12, 2008. ^ "Severe storms hit Mississippi". The Meridian Star. March 4, 2008. Archived from the original on January 28, 2013. ^ "SPC Storm Reports for 03/03/08". National Weather Service. March 13, 2008. ^ "SPC Storm Reports for 03/04/08". National Weather Service. March 14, 2008. ^ "Tornado batters Florida; winter storm prompts warnings". CNN. March 7, 2008. Archived from the original on June 9, 2008. ^ "Tornado trashes Atlanta". CNN. March 16, 2008. Retrieved May 25, 2010. ^ "Mar 15, 2008 0600 UTC Day 1 Convective Outlook". National Weather Service. March 15, 2008. ^ "Mar 15, 2008 2000 UTC Day 1 Convective Outlook". National Weather Service. March 15, 2008. ^ "New twister kills 2 northwest of Atlanta". MSNBC. March 15, 2008. ^ "Officials Confirm Edmond Storm Produced F1 Tornado". KOCO. March 31, 2008. ^ "Mar 31, 2008 1630 UTC Day 1 Convective Outlook". National Weather Service. March 31, 2008. ^ "March 31st, 2008 Tornadoes, Severe Storms, and Flooding". National Weather Service. ^ Rued, Monika (June 4, 2008). "Tornado Sweeps Central Arkansas". KTHV. ^ Mitchell, Meredith (June 7, 2008). "Ten Confirmed Tornadoes In Central Arkansas". KTHV. ^ "SPC Storm Reports for 04/04/08". National Weather Service. April 14, 2008. ^ "Damage to the Jackson Metro Area". National Weather Service. April 11, 2008. ^ "SPC Storm Reports for 04/08/08". National Weather Service. April 18, 2008. ^ "Apparent Tornado Strikes Breckenridge, Injures 15". KTVT. April 9, 2008. Archived from the original on November 22, 2008. ^ "April 9–10 Severe Weather Outbreak". National Weather Service. April 12, 2008. ^ "2008 Oklahoma Tornadoes". National Weather Service. June 4, 2008. ^ "Storm Survey Results for April 10th Tornadoes". National Weather Service. April 11, 2008. ^ "Heavy Rain/Severe Weather on April 8–10, 2008". National Weather Service. April 16, 2008. ^ "Severe Weather Plummels Area Thursday Afternoon and Evening". National Weather Service. April 11, 2008. ^ "Storm Damages Several Buildings, Injures 1 Person". WTVF. April 11, 2008. ^ "Storms Damage Homes In Centertown". WTVF. April 11, 2008. ^ "SPC Storm Reports for 04/11/08". National Weather Service. April 21, 2008. ^ "Clinton County Tornadoes". National Weather Service. April 22, 2008. ^ "EF-2 Tornado with Winds Near 130 MPH Confirmed in Wayne County". National Weather Service. April 12, 2008. ^ "April 11, 2008 Severe Weather". National Weather Service. April 24, 2008. ^ "Governo aprova conta de emergência para catástrofes" (in Spanish). Rádio e Televisão de Portugal. April 10, 2008. Archived from the original on February 10, 2012. ^ "SPC Storm Reports for 04/23/08". National Weather Service. May 3, 2008. ^ a b "SPC Storm Reports for 04/24/08". National Weather Service. May 4, 2008. ^ "Severe Weather Survey and Damage Information from 4/25/2008". National Weather Service. May 25, 2008. ^ a b "Storms tear through Virginia; homes destroyed in Suffolk". WAVY-TV. April 29, 2008. Archived from the original on April 30, 2008. ^ "Tornadoes leave path of destruction through Suffolk and elsewhere". WAVY-TV. April 29, 2008. ^ "Major Tornado Event Across Southeast Virginia". National Weather Service. April 28, 2008. ^ "Storm Damage in Halifax County Virginia Caused by EF1 Tornado". National Weather Service. April 29, 2008. ^ "Witnesses report tornado in Mississippi". CNN. May 8, 2008. Retrieved May 25, 2010. ^ Reported twister tears through central North Carolina Archived May 10, 2008, at the Wayback Machine Retrieved May 9, 2007. ^ "NCDC: Event Details". Archived from the original on May 18, 2008. Retrieved May 9, 2008. ^ Tornadoes leave at least 22 dead Cable News Network. Accessed May 12, 2008. ^ Officials confirm 12 now dead in Newton County in wake of tornado Archived May 14, 2008, at the Wayback Machine Neosho Daily News. Accessed May 11. ^ One Person Killed in Georgia Storms Accessed May 11, 2008. ^ Putsaya, M.; A. Simon; I. Szenyán; J. Kerkmann; Gy. Horváth (June 2011). "Case study of the 20 May 2008 tornadic storm in Hungary – Remote sensing features and NWP simulation". Atmos. Res. 100 (4): 657–79. Bibcode:2011AtmRe.100..657P. doi:10.1016/j.atmosres.2010.08.008. ^ May 22, 2008 0600 UTC Day 1 Convective Outlook Storm Prediction Center. Accessed May 22, 2008. ^ May 22, 2008 2000 UTC Day 1 Convective Outlook Storm Prediction Center. Accessed May 22, 2008. ^ "Tornado slams Laramie". Denver Post. May 22, 2008. ^ "Mile-wide tornado hits Windsor, Weld County". Denver Post. May 22, 2008. ^ May 23, 2008 0600 UTC Day 1 Convective Outlook Accessed May 23, 2008. ^ "Jun 3, 2008 0600 UTC Day 1 Convective Outlook". National Weather Service. June 3, 2008. ^ a b "Numerous People Injured As Storms Plow Through Indiana". WRTV. June 4, 2008. ^ "Daniels Tours Storm-Damaged Camp Atterbury". WRTV. June 5, 2008. ^ "SPC Storm Reports for 06/03/08". National Weather Service. June 4, 2008. ^ a b "Historic Outbreak of Tornadoes Feared". America Online. June 5, 2008. ^ Cyr, Emily (June 4, 2008). "One Killed As Storms Move Through Area". WUSA. ^ "June 4, 2008 Severe Weather". National Weather Service. June 4, 2008. ^ Broom, Scott (June 5, 2008). "Weather Service Confirms Tornado In Chesapeake Beach". WUSA. ^ Bergen, Chester (June 5, 2008). "Tornado confirmed in Chesapeake Beach". CalvertNews.info. Archived from the original on June 18, 2008. ^ "Jun 4, 2008 0800 UTC Day 2 Convective Outlook". National Weather Service. June 4, 2008. ^ a b "Ceresco, Ulysses Survey Damage". KETV. June 5, 2008. Archived from the original on September 27, 2011. ^ "SPC Storm Reports for 06/04/2008". National Weather Service. June 5, 2008. ^ "Jun 5, 2008 1300 UTC Day 1 Convective Outlook". National Weather Service. June 5, 2008. ^ "Multiple tornadoes reported in region". St. Joseph News-Press. June 6, 2008. Archived from the original on June 22, 2008. ^ "SPC Storm Reports for 06/05/2008". National Weather Service. June 6, 2008. ^ "Storms sweep Midwest; tornado in Minnesota". CNN. June 6, 2008. Archived from the original on June 7, 2008. 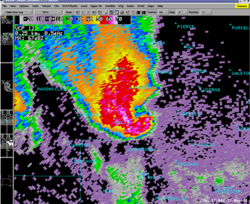 ^ "Storm spawns tornado in northwestern Minnesota". Duluth News Tribune. June 7, 2008. ^ "Jun 7, 2008 2000 UTC Day 1 Convective Outlook". National Weather Service. June 7, 2008. ^ "Results from Storm Surveys of June 7th Tornadoes". National Weather Service. June 11, 2008. ^ Thomas, Monifa; D. Rozek (June 8, 2008). "Tornadoes rip south suburbs". Chicago Sun-Times. ^ "I-57 Reopens After Storm Damage". WBBM-TV. June 8, 2008. Archived from the original on June 10, 2008. ^ "Six injured in Saturday storms in Columbia County; none serious". Portage Daily Register. June 8, 2008. Archived from the original on June 18, 2008. ^ "EF1 and EF2 Tornadoes Hit Portions of Omaha Metro 6/8/08-Updated". National Weather Service. June 10, 2008. ^ Youker, Meghan (June 9, 2008). "Tornado Hits Millard In The Middle Of The Night". KPTM. Archived from the original on June 18, 2008. ^ "Official: EF-2 Tornado Hits Millard". KETV. June 8, 2008. Archived from the original on September 27, 2011. ^ "SPC Storm Reports for 06/08/2008". National Weather Service. June 9, 2008. ^ "Perth tornado 'may have hit 150km/h'". Australian Broadcasting Corporation. June 9, 2008. ^ "Jun 11, 2008 1300 UTC Day 1 Convective Outlook". National Weather Service. June 11, 2008. ^ "NWS: Little Sioux Tornado Classified as EF3 Tornado". KPTM. June 12, 2008. Archived from the original on February 10, 2012. ^ "Search and Rescue Completed in Chapman; Damage Assessments Continue" (Press release). governor.ks.gov. June 12, 2008. Archived from the original on May 2, 2009. ^ a b "Official Report: EF 4 Tornado in Manhattan; EF 3 in Chapman". WIBW. June 12, 2008. ^ "Tornado Damages 32 Homes, Kills Man in Jackson County, Kansas". KAKE. June 12, 2008. Archived from the original on July 13, 2011. ^ "At least nine homes destroyed in Salina tornado". KSNW. June 12, 2008. Archived from the original on June 15, 2008. ^ a b "SPC Storm Reports for 06/12/08". National Weather Service. June 12, 2008. ^ a b "Updated: 28 Tornadoes So Far in Wisconsin". National Weather Service. ^ Brahney, Marisa (June 13, 2008). "Several homes damaged in storm". WBBH-TV. Archived from the original on June 14, 2008. ^ "NWS confirms Friday's tornado in Cape". WBBH-TV. June 14, 2008. Archived from the original on June 18, 2008. ^ "Grandin, Missouri EF1 and Friday June 13 Storm Summary". National Weather Service. June 14, 2008. ^ "Tornado Touches Down in Springfield". KSPR. June 20, 2008. Archived from the original on June 22, 2008. ^ "Chatham County, Georgia damage survey". National Weather Service. June 20, 2008. ^ "China tornado 'kills 1, destroys 650 homes'". Australian Broadcasting Corporation. June 22, 2008. ^ "An EF1 Tornado Touched Down in Rural McDonald County". National Weather Service. July 3, 2008. ^ "EF-0 Tornado Confirmed in Johns Island, SC". National Weather Service. June 30, 2008. ^ "SPC Storm Reports for 07/07/08". National Weather Service. July 9, 2008. ^ "Twister topples trees, sinks boats". CTV Winnipeg. July 7, 2008. ^ "Tornado Clean-up and Help". KXMC-TV. July 10, 2008. ^ "Small tornado confirmed in Whitley County". WANE-TV. July 11, 2008. ^ "National Weather Service: tornado hit Petersburg". WRIC-TV. July 10, 2008. ^ "2 tornados hit southeastern Minnesota". Minnesota Public Radio. July 10, 2008. ^ "Authorities: No help needed in Willmar". Star Tribune. July 12, 2008. ^ "SPC Storm Reports for 07/10/08". National Weather Service. July 10, 2008. ^ "SPC Storm Reports for 07/11/08". National Weather Service. July 11, 2008. ^ "EF-0 Tornado Confirmed in the Becker and Big Lake Areas on Saturday". National Weather Service. July 21, 2008. ^ "Preliminary Local Storm Report (Lincoln, IL)". National Weather Service. July 22, 2008. Archived from the original on July 23, 2008. ^ "Tornado hits Butler County; no damage reported". Pittsburgh Post-Gazette. July 24, 2008. ^ "National Weather Service Confirms EF1 Tornado on July 23 in Warren Rhode Island and Swansea Massachusetts". National Weather Service. July 24, 2008. Archived from the original on July 25, 2008. ^ "Confirmed tornado in Welland on Tuesday July 22". Environment Canada. July 22, 2008. Archived from the original on November 19, 2008. ^ "Tornado touched down in N.H. storm; 200 houses damaged". The Boston Globe. July 25, 2008. ^ "Tornado Hit Confirmed In 9 N.H. Towns". WBZ-TV. July 25, 2008. Archived from the original on July 26, 2008. ^ "SPC Storm Reports for 07/22/08". National Weather Service. July 27, 2008. ^ "SPC Storm Reports for 07/23/08". National Weather Service. July 27, 2008. ^ Brennan, Hab (August 24, 2009). "Holy Moly tornado". Environment Canada. Archived from the original on August 28, 2008. ^ "European Severe Weather Database". European Severe Storms Laboratory. ^ a b "SPC Storm Reports for 08/04/08". National Weather Service. August 4, 2008. ^ "Three Tornadoes Confirmed Thus far from Monday Evening's Storms". National Weather Service. August 5, 2008. ^ "Chicago tornado warning sounded; Wrigley cleared". Associated Press. August 4, 2008. Archived from the original on August 8, 2008. ^ "Expert: "This looks like tornado damage"". Northwest Indiana Times. August 5, 2008. ^ "Preliminary Local Storm Report (Miami, FL)". National Weather Service. August 14, 2008. Archived from the original on August 16, 2008. ^ "Nawałnice nad Polską zabiły dwie osoby". TVN24. August 15, 2008. ^ [Tornado] 01.10.2008 – Marienthal (OHV, Brandenburg) (German). Accessed January 21, 2009. ^ "December 9, 2008 National Weather Service warning archive". Retrieved December 9, 2008. This page was last edited on 19 March 2019, at 01:59 (UTC).